This ensemble of limewood carvings was supplied by Grinling Gibbons, the celebrated and influential late 17th century carver. It was supplied, as part of a much larger group of carvings to Arthur Capel, first Earl of Essex (died 1683), for his country house, Cassiobury Park near Watford, Hertfordshire. It surrounded a portrait hung above a door in the dining room. Cassiobury was one of the earliest-known English houses to be decorated with limewood foliage carving, rather than the more traditional oak. For the suite of ten reception rooms Gibbons' provided overmantels, panels, borders and frame surrounds. In June 1922, the house and park were offered for sale and having remained unoccupied and unsold, the house itself was demolished in 1927. Gibbons’ limewood foliage carvings are typically built up from two or three layers, at least 3-4cm thick, with separately carved elements such as fish or fruits studded on. Gibbons would have worked on the carvings with the help of apprentices and experienced journeymen carvers. Freshly carved limewood presents an arrestingly pale appearance, especially obvious when it was mounted against oak panelling, which would have been very striking in 1675 to those more accustomed to darker wood carving. Limewood picture surround carved in high relief, and consisting of a swag (centred on a blank cartouche, originally bearing a shield) above two vertical drops, each one 'suspended' from a round peg. The swags and drops with various combinations of flowers (including tulips and forget-me-nots), leaves, fruit (grapes, pears, peaches), pea-pods, acorns, ears of wheat, all slightly larger than life-size. There are also some elements of a different character, for example a sea shell at top right, which appears to be out of place and possibly inserted from another piece of Gibbons carving, presumably also from Cassiobury. Some individual elements are out of scale (smaller than life-size) or more detailed than the majority, suggesting that they too may have been added from a stock of Cassiobury fragments after it was removed from its position in the house (information supplied by David Luard, December 2011). 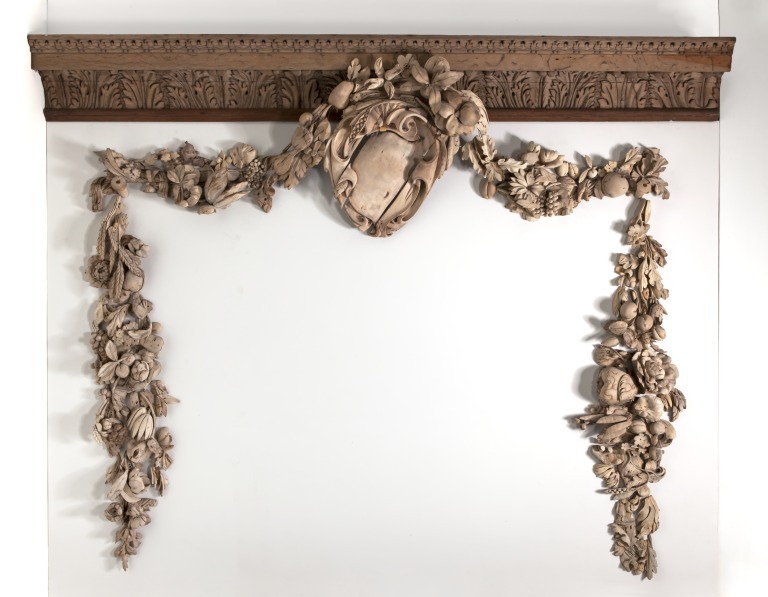 At acquisition, the carved limewood picture surround was mounted on a modern backboard (softwood with hessian lining and painted green paper), beneath a horizontal section of oak cornice, museum no. W.46-1926. For redisplay in gallery 133, 2011-12 the carvings were removed from the backboard, cleaned (residues of white, lead paint) and neutralised, and remounted directly to boards fixed onto the gallery wall, with wire supports and metal pins as necessary. The depth of carving is created by laminating boards (usually about 1 1/2" - 2" thick, but iregular), supplemented with some individual motifs carved in the solid. The various elements are apparently held together (and to the backboard) with iron nails. The two 'pegs' are carved from single pieces, with added caps. Photographs of the carvings as configured c1925 by the Museum show various differences compared to photographs of the picture surround in situ at Cassiobury, c.1910. The 2012 display sought to replicate, as far as possible, the configuration as photographed c.1910. However, certain elements of the composition as photographed c1910 cannot have been configured that way originally, such as the horizontal pea-pod half way up the right drop (which would only make sense vertically). Some rearrangement of the individual elements of Gibbons decorative carvings presumably took place since the 1670s, perhaps during the course of attempts to 'freshen' them up. Modifications might have been required as a result of damage incurred by insect infestation - evidence for which can be seen in numerous areas. (This last suggestion provided by David Esterley, pers. communiation 8/8/2011). Given by Harry Lloyd, Woodlands, Caterham, Surrey (RF 26/5438), who purchased it on behalf of the Museum from Edwards & Sons, 157-161 Regent Street, London W1. Museum correspondence refers to the purchase of an "Overdoor from the Great Dining Room...for the sum of £385.0.0 as it stands, with no extra charge for stripping." "This is a most generous proposal to present to the Museum two examples of woodcarving by the school of Grinling Gibbons, removed from Cassiobury Park, Hertfordshire. I saw the carvings more than once in their original position and they are certainly of historic importance. They were removed and sold a few years ago and the remains of them are now in the hands of Mr. Edwards of Regent Street and Robertsons of Knightsbridge. Mr. Clifford Smith and I have been to see the carvings at both places and finally selected two examples coming within the figure of £400 which Mr. Lloyd has proposed to spend. The carvings of the house were originally sold for a very large sum and the most important examples are still priced at about £800. 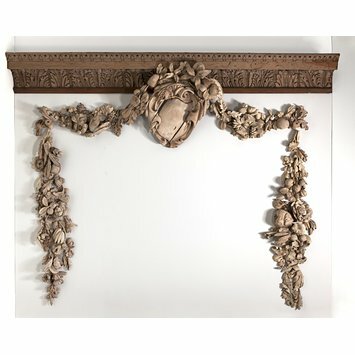 We have no doubt that the overmantel and frame are the best examples that can be obtained for the money at our disposal. The overmantel which we have selected, as it was shewn to us, seemed to me to be incomplete and unsatisfactory without the cornice moulding. Mr. Edwards, of Regent Street, has kindly offered to add a section of moulding after it has been pickled, and I think we should write and thank him as well as Mr. Lloyd." What is referred to variously as 'overmantel' and 'Overdoor from the Great Dining Room' appears, by comparison with photographs of Cassiobury Park interiors c.1910, to be the picture surround above the south doorway (as captioned by Avray Tipping). After Essex returned from Ireland in 1677 (having served as Lord Lieutenant of Ireland 1673-77) he lived at his house in St James's Square, London, and at Cassiobury Park. His new state rooms, probably installed c1675-77, and possibly later, featured mantles of Irish marble, carvings by Grinling Gibbons, and painting by Antonio Verrio. In 1683, Essex, along with other senior political figures who feared the perils of Catholicism influence towards the end of Charles II’s reign, became a conspirator in the Rye House plot. He was arrested at Cassiobury on 9 July, incarcerated in the Tower of London, and died there on 13 July under suspicious circumstances. With Holme Park (begun 1684, also under Hugh May), Cassiobury was the earliest-known English house to be decorated with limewood foliage carving, rather than the more tradtional oak. The house was altered c.1800 but that work did not seriously affect the suite of ten reception rooms where Gibbons' carved overmantels, panels, borders and frame surrounds were installed: the dining-room (from which this over door carving is said to come), the Oval room, the Green drawing-room, library, inner library, little dining room. Between 1835 and 1865 the carver William Gibbs Rogers records that Gibbons carving 'had been covered over and loaded with a thick brown paint and heavy varnish. All the feathering of the birds and veining of the leafage were effaced, smothered up and had vanished; and what repairs had been made were wrought in plaster or a composition.' (Quoted by Tipping, p.78, n.3 citing RIBA Proceedings, 1867, p.181) In June 1922, the house and park were offered for sale and having remained unoccupied and unsold, the house itself was demolished in 1927. Various Gibbons' carvings were bought for the Hearst and Wernher collections.The grand staircase in pine, ash and oak (previously said to be designed by Gibbons but now attributed to Edmund Pearce and dated c.1677-80) was acquired by the Metropolitan Museum of Art, New York. 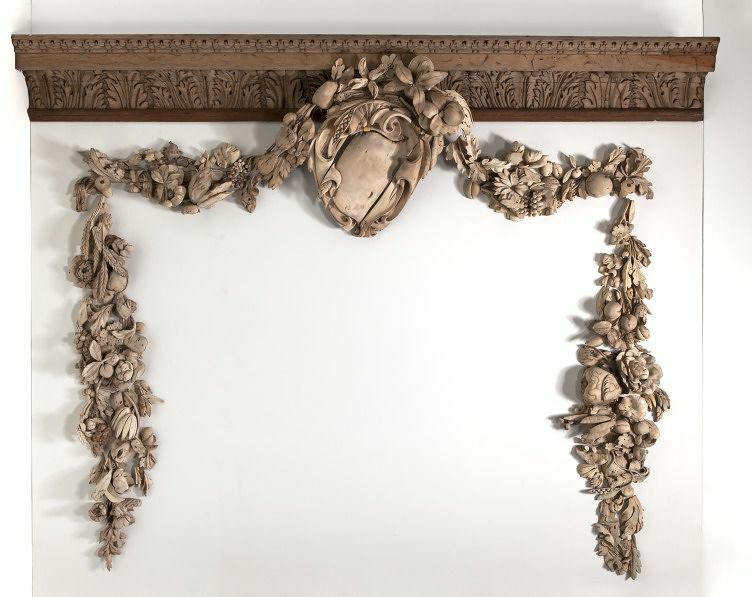 An overmantel from the Green drawing room to the Cleveland Museum of Art, and an overmental from the Inner Library to the Art Institute of Chicago (now thought to date from 1683 or later). See H. Avray Tipping, Grinling Gibbons and the Woodwork of his age (1648-1720), (London, 1914), and David Esterly (Grinling Gibbons and the Art of Carving. (London, V & A Publications, 1998), p. 64, 179,183). The History and Description, with Graphic Illustrations, of Cassiobury Park, Hertfordshire, the Seat of the Earl of Essex, by John Britton,... (1837), 37p. The grain structure of limewood makes it uniquely suitable for the curviform shapes of leaf, fruit and flower, and for their thin stems. Freshly carved limewood presents an arrestingly pale appearance, especially obvious when it was mounted against oak panelling, which would have been very striking in 1675 to those more accustomed to darker wood carving. Gibbons’ limewood foliage carvings are typically built up from two or three layers, each 2 or 3 inches thick, joined (possibly glued) before carving, in order to build up a thickness of wood less susceptible to warping than solid wood. This was a traditional technique used for continental high relief sculptures. The Cassiobury carvings typically use laminated 1 1/2” thick boards, with separately carved elements such as fish or fruits studded on. Sometimes Gibbons uses side to side joining to make up the relatively narrow width of the drop. Later in his career, during the 1680s, Gibbons moved away from a lamination technique, using instead a single thick board, and/or ‘some degree of separate carving and assembly’, with the advantage of avoiding lamination lines at inconvenient points in the carving (Esterly p.177). Attaching the boards by nailing rather than glue was a better defence against warping and cracking, and allows ‘each layer to be fastened to the level below by means of a very small platform’ around which air and space can flow. Mechanical attachment also allowed each layer to be carved separately before assembly – with the advantage of reducing the amount of cumbersome chisel excavation. 'The early overmentels, at Holme Lacy and Cassiobury...show an indifference to strict symmetry between the two side drops. In shape, size and placement, the separately-carved layers within these drops do not correlate to any answering elements elsewhere in the carving. There is an extempore quality to the design which makes for an intense localism in construction. Separate elements take their form strictly from their immediate setting and so tend to be inseperable in execution, encouraging a simple vertical division of workshop labour. Carved limewood, consisting of numerous elements of fruit and flowers composing two swags centred on a cartouche (missing the superimposed coat of arms), and two lateral drops. Limewood is particularly suitable for high-relief carving. It is soft but ‘elastic’, structurally uniform and easier than other hardwoods to cut across the grain.